The syndicated pilferage at the Murtala Muhammed International Airport (MMIA), Lagos, is becoming worse as passengers now complain of missing luggage on arrival at the airport. Blame over loss of baggage has been put at the doorsteps of the Nigerian Aviation Handling Company Plc and the Skypower Aviation Handling Company Limited, whose workers were alleged to be culpable. Efforts to get reaction of the Federal Airports Authority of Nigeria (FAAN) failed as at press time. The stealing is fast taking the joy out of travel as many passengers last week complained of luggage loss. The situation could also be put at the doorsteps of FAAN, which primary duty is to ensure security at the airports. On April 19, 2013, a Lagos-bound Arik Flight W3 108, which took off from John F. Kennedy Airport in New York at 12. 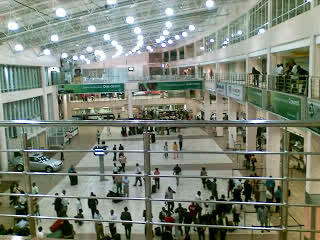 35 pm, touched down at MMA Lagos at 3.05 am on Friday morning (9hrs 30mins) after some frightening hours of turbulence across the Atlantic Ocean only for nearly half of the passengers to discover that movement of their luggage from the aircraft to the conveyer belt was left in the hands of criminals working as airport officials. Some of the victims, Patricia Nnaeke, Valentina Jummy, Opaleye Mukaila, Adebayo Ariyo, Joy Tongo Olarenwaju Fasasi, Rev. Emma Umezinwa and Abimbola Atta lost their baggage. In a joint statement made available to The Guardian yesterday, the group said: “Bags were torn apart. Padlocks were destroyed. A young Nigerian mother with her baby at the back found one of her bags completely emptied of the contents. Some bags were not seen at all. A man lost all the four laptops he bought from the U.S. A Catholic priest had his bag ripped apart and had messages meant to be delivered to some families carted away. And all this took place within 45 minutes of their arrival when the conveyer started rolling out the bags”. According to the statement, the passengers immediately reported to the Immigration, Customs and Police officers in uniform, who did nothing but watched as some passengers nearly ran mad with anger and frustration. To them, the Murtala Muhammed International Airport, which ought to be a national image booster and monument welcoming all coming into the country has become a place of national shame, official ineptitude and syndicated robbery. “This was the point when one of the passengers took out his Ipad and started recording the pandemonium, interviewing passengers and documenting necessary evidence. The airport officials were constantly avoiding the camera and at some point, wanted to intimidate the passenger who stood his ground. “Unknown to those airport officials, the man was a Catholic priest with years of media practice. There was another passenger (a victim too) who worked for The Guardian. They quickly organised themselves and wrote the names of the victims and some of the items lost just for the records. That list was copied by an airport officer, by name Emwanta, who promised to follow up on the recovery of the items”.